I was lucky enough to be asked to head a roundtable last week instigated by the English department at the college at which I am a graduate fellow. English department faculty were interested in learning about strategies to incorporate images into their classroom lectures, in particular the required freshman seminar survey titled “Great Works” that works – you guessed it – very much like our “Prehistory – Present” art history survey. The English textbooks they ask their students to buy come with illustrations, but many instructors felt hesitant about adding artworks into their lesson plan, or interested in ways to deepen engagement with the visuals they already use. The hesitation (their own and/or their students’, depending on the instructor) seemed very close to how students feel when they enter an art history classroom for the first time, or museum visitors to a new museum or exhibition – or, perhaps more aptly, how I feel when I am asked to really analyze a poem nowadays, with my Eng Lit 101 days far behind me: nervous, worried I don’t have the right vocabulary to undertake the task, or to facilitate for my students. As the idea for the roundtable was fleshed out, it became clear that the conversation had to be a two way street – I felt art historians had as much to learn about how to incorporate texts further into their classrooms (or at least new strategies for doing so) as vice versa. What followed was a really fruitful discussion last Thursday, and a body of resources I am going to document here in order to share them with the participants who attended the roundtable – and those who couldn’t make it at my college, and beyond – in hopes that they could be added to. I began the roundtable by sharing the way I often present learning with images to my students (almost always business students or studio art majors in my required survey classes). I offer the art history survey class, when appropriate, as an extended exercise in developing visual literacy skills that will be transferable assets when students reach the job market or undertake other academic pursuits. I show my students the results from the Guggenheim’s Learning Through Art studies that demonstrate how looking closely at artworks using open-ended questions increases literacy and problem solving in many other areas. I also tell them about Columbia University’s Arts in Medicine Narrative Medicine program, where med students develop the close observational skills they’ll need in the doctor’s office or in the surgery theater through “long looks” with Rika Burnham at the Frick or the Met museum. What’s good practice for med students is also good practice for my survey students too. I don’t need to justify why we are looking per se, but it can help to persuade the reluctant at the beginning of the semester. 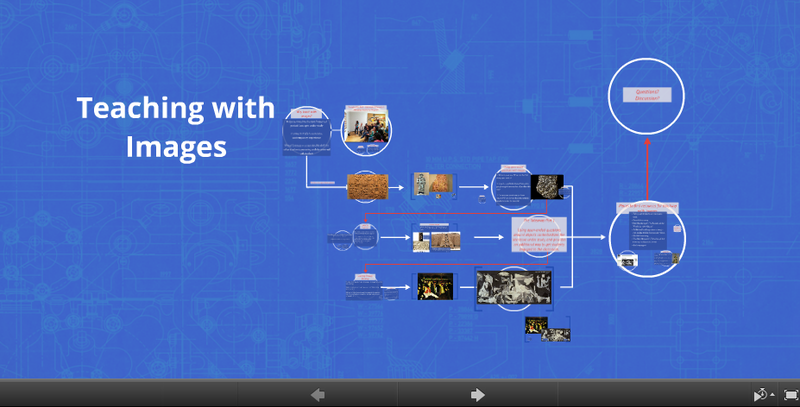 I’ve linked to my Prezi above which explains the rough outline of the presentation, and offers a list of resources (below) as well as two concrete examples of how to tie images into a discussion of a Great Works text. I chose to connect the British Museum’s beer counting tablet (so well explained by Neil MacGregor in A History of the World in 100 Objects) to the Epic of Gilgamesh, and Pablo Neruda’s poem I’m Explaining a Few Things (introduced to me by one of the roundtable instigators, Prof. Cheryl Smith) with Picasso’s Moulin de la Galette and Guernica. I have handouts for both, which describe my logic and basic lesson plan structure (I hope) here and here. 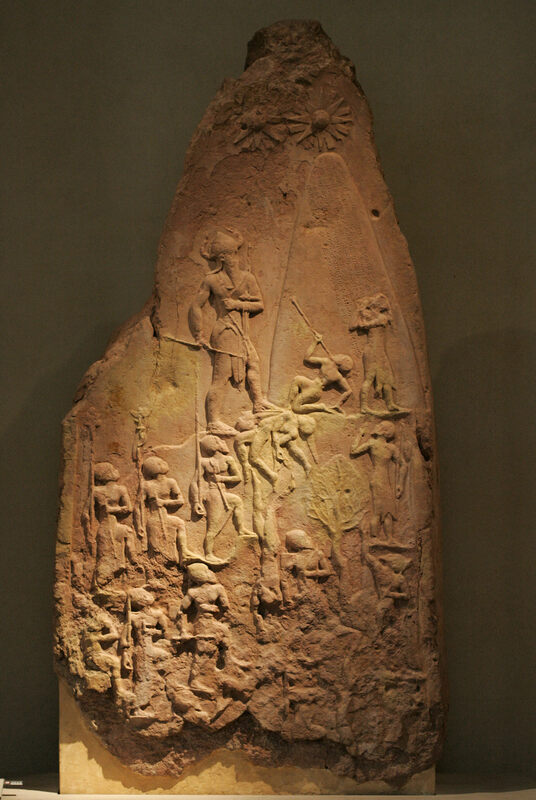 In short, in the first exercise, I suggested that asking students to look at the “Beer Tablet,” and then at a statue of Gudea and the famed Stele of Naram-sin, starts a discussion about how cuneiform was a trading tool, and then a political propaganda tool, before it was a tool of imagination and literature. This offers the development of the apparatus of culture and civilization – what was needed as the basic foundations for survival and evolution – before looking at its further fruits in the form of the tablet that contains the epic (which MacGregor also handily covers). The comparison of Picasso’s Moulin de la Galette vs. Guernica is all about context. To anyone not pre-prepped, it’s very possible not to have a clue who painted Moulin. It doesn’t display Picasso’s “signature Cubist style” (a myth – he was a chameleon – but whatever). It was painted by him aged 19, when he first came to Paris to visit the World’s Fair and the sites of his artist-heroes. He was an unknown when he painted this. Viewing it, I think you can almost taste the teenage excitement at seeing Parisian nightlife for the first time. Guernica is, of course, quite different. At the roundtable, we compared and contrasted the works through a partner exercise I learned at the Guggenheim – one person describes to the other who is unable to see the image, and who draws it based on the partner’s description (full set-up directions are in the Prezi). The exercise gets students talking about the images in front of them, demonstrating that they don’t need any “special” vocabulary to do so. The deeper comparison between the two images and Neruda’s text came in understanding how the social, historical, political and economic context for both the poet and the painter fundamentally affected their creative output. As I say above, take a look at the lesson plan PDFs for the types of questions and discussion points that shaped our roundtable investigation. We finished by talking about how to engage students in front of objects at the museum, and I shared the Museum Observation Prompts sheet that I have crowdsourced from others over the years. As a parting thought: after the roundtable the concern was raised from some corners that by having these interdisciplinary conversations (which everyone agreed was a great thing) art historians might be “giving away their field.” The worry? That if images were really incorporated into conversations in English Literature classes, Art History classes will become obsolete – especially in colleges where there is no dedicated Art History department and there is a complicated politics in getting classes through the Registrar. Personally, I can’t see interdisciplinarity as anything but a good thing, but then I am not involved in the politics of college administration. I’d be interested to hear your thoughts on this, and other combinations of images and texts that you have had success with, or want to workshop further in the comments below. Michelle Millar Fisher is a doctoral candidate in Art History at the CUNY Graduate Center. She is currently an Adjunct Lecturer at Parsons The New School for Design & CUNY’s Baruch College, co-founder of the Art History Teaching Resources site, and Project Manager for the 2014 College Art Association THATCamp. You can find a full work and academic bio here.